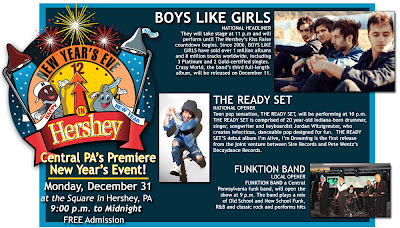 The New Year’s Eve celebration will be held at the square in the heart of downtown Hershey and is free to the public. Activities begin at 10 a.m. on New Year’s Eve day. Teen pop sensation, THE READY SET, will be performing at 10 p.m. American rock band, BOYS LIKE GIRLS, is the evening’s featured act. They will take stage at 11 p.m. and will perform until the countdown begins. The evening will culminate with the lowering of the giant Hershey’s Kiss replica followed by a fireworks display at midnight. Food and non-alcoholic beverages will be available by various vendors throughout the evening. 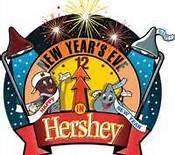 come stay the night and enjoy News Years in Hershey.